For many people the first experience they have with buying diamonds is when they are shopping for an engagement ring. And although this is an exciting time, it is important to buy an engagement ring based on certain factors as opposed to making a quick, emotional purchase. Unfortunately, this usually isn’t what happens. Often times people will first shop based on price and once they have found a few choices in their price range, they will choose an engagement ring by how it looks. It is mostly personal taste that dictates the purchase decision. However, there are certain factors that should be considered when buying an engagement ring that will help to ensure that the diamond is real and not a fake. All diamonds are classified according to four criterions–The Four C’s as they have become known. They are clarity, cut, color, and carat. Understanding what each of these factors are and how they impact the value of a diamond is extremely important so let’s take a closer look at each one. The higher the diamond is on the clarity grading scale the more expensive the ring will be. Therefore, many people will opt to buy an engagement ring with some flaws in exchange for a cheaper price. This is also the first indication that a diamond may be fake. If a jeweler is selling a “flawless” engagement ring for a cheap price, the chances are good that it is a fake. 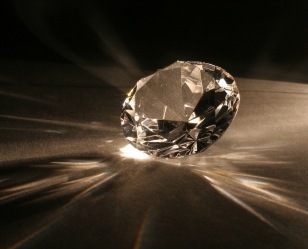 Many people mistakenly assume that the cut of the diamond is the shape. The cut however, refers to how much light the diamond will reflect. The more light reflected, the better the diamond is. The less light reflected the poorer quality it is. Similar to clarity, the better the cut, the more expensive the ring will be and if an engagement ring with an Ideal Cut is being sold for a very cheap price, then it is more than likely a fake. D, E, and F — These are completely colorless and near perfect. G, H, I, and J — These have a faint color to them but are still near perfection. K, L, and M — These grades have a bit more color than other grades thus far. O to Z — Diamonds in this grade has the most color to them. The Newspaper Test — A real diamond should not permit the viewer to see through it. An easy way to check this is to place the diamond on a newspaper. If any part of the newspaper is visible through the diamond, then it is a fake. The Microscope Test — Using a 1200X microscope to look at the diamond will help to determine if there are any flaws and to determine if you can see through it. Similar to the newspaper test, if you can see through the diamond, then it is probably fake. Another variation of this test is to hold the diamond up towards the light in an attempt to see through it. The Fog Test — When a real diamond is exposed to fog, it will remain clear whereas a fake diamond will not. So, simply fogging up a diamond will reveal its true nature. The Sandpaper Test — Diamonds are the hardest matter on the earth and nothing should be able to scratch them. Although it may seem scary, rubbing a piece of sandpaper on a diamond will really help to determine its validity. A fake diamond will be easily scratched but a real diamond will remain unharmed. The Sideways View Test — It is difficult to know for sure if a diamond is real or fake simply by looking down at it, from a bird’s eye perspective. But looking at a diamond from a sideways view will really help to pinpoint imperfections and imposters. Again, the less color a diamond has, the more expensive it will be. So, if a diamond is graded as a D but is being sold for cheap there is a likely probability that it is fake or the grade is being misrepresented. This final factor is the weight of the diamond. A carat is equal to approximately .2 grams and the bigger the carat, the more expensive the diamond. The reason for this is that most naturally made diamonds are on the small side. Therefore, when nature does make a big diamond, it is highly valuable. Unfortunately, because diamonds are so valuable and because people are willing to pay high prices to obtain them, it has led to some unsavory business practices such as selling fake diamonds or misrepresenting the quality of diamonds. Although the Four C’s are a great tool for evaluating diamonds, there are other ways to spot a fake diamond including the newspaper test, the microscope test, the fog test, the sandpaper test, and the sideways view test. Knowledge is power and knowing the right information is important when purchasing a diamond engagement ring. However, even the most trained eye can be misled by some of the more superior imposters on the market. Therefore, here are a few other tips to keep in mind when buying diamonds. Ask friends and family members for referrals. If someone you know had a good experience with a specific jeweler, then chances are good that you will have a good experience with the same person too. Simply ask if the ring is authentic or something other than a diamond such as a cubic zirconia or some other synthetic substance. Any reputable jeweler will have no issues with telling the truth. Closely examine the setting and the mount that holds the diamond. If it’s a fake the setting will also be made of a cheaper substance. If you are still unsure of the authenticity of a diamond, take it to a third party, independent appraiser. Preferably by a jeweler who is affiliated with the American Society of Appraisers (ASA). They will be able to determine if it’s fake or real. The Gemological Institute of America (GIA) is the largest, most respected and impartial diamond appraiser in the world. Always ask for and never buy a diamond that doesn’t have a GIA certificate of authenticity. Overall, the best way to ensure that a diamond is real is to know exactly what you are looking for. Don’t blindly trust a jeweler–Verify what they say and don’t be afraid to ask for a second opinion.